Weddings are one of the biggest celebrations listed, and any celebration should include laughter, love and just general happiness! 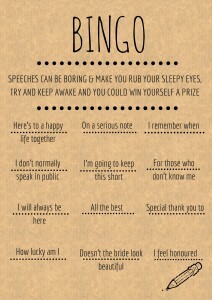 If you’re looking for a way to keep your guests entertained, both big and small. 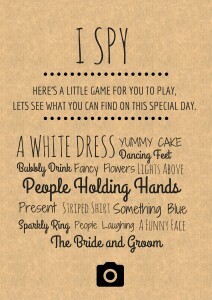 Or if you’re just wanting to add that extra sparkle to your special day, why not liven the atmosphere up with some games! 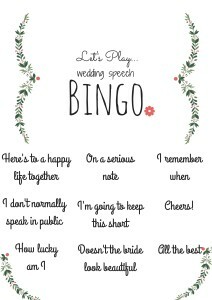 Don’t worry we’re not suggesting you have a human game of “Hungry Hippo’s” or encourage your guests to start a conga after the vows. 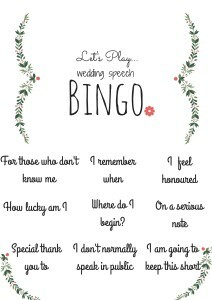 Why not have a scroll through our FREE printable table games and see if there’s any which you could incorporate into your day. If you wish to download any of the games simply click on the image, remember they’re free! The first of our 4 FREE games is Question Time. 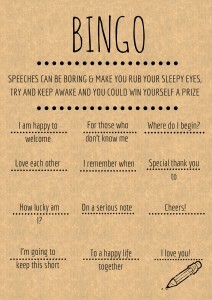 This table game allows your guests to answer 7 questions about yourself or your other half. 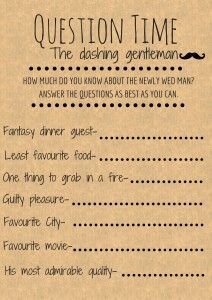 Instruct all guests to fill one in and post it in your Post Box then the next day you can both read all of the funny answers which people may have come up with! 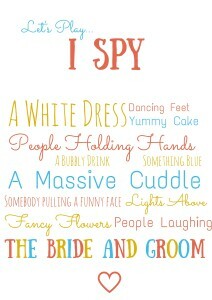 It could be debatable to which is a more challenging task- planning a wedding or having dinner with a 4 year old. Then again, I suppose the phrase “challenging task” doesn’t do the process justice, it’s hard enough to keep them in their seat, never mind preventing them from playing with the salt and pepper pots and drawing all over your new table cloth from John Lewis. 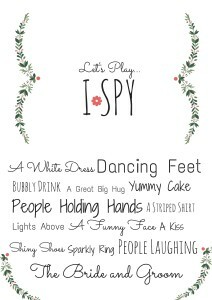 If you’re worried about keeping the little monkeys quiet and occupied at your wedding then these ‘I Spy’ Printable Table Games are a great solution. Weddings wouldn’t be weddings without several speeches from the couples families and friends. It’s lovely to hear all of the kind words of wisdom and flash backs. However, it can get a little bit tedious. 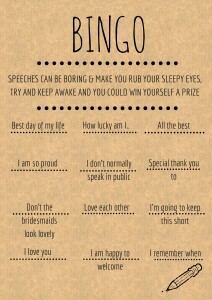 Why not incorporate a fun friendly game of Wedding Speech Bingo to your big day? With 4 different combinations in each design and suitable for all ages this game is a crowd pleaser. 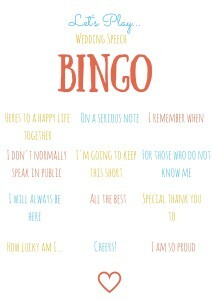 Hand one per a table and the winners can have a small prize… Or just a pat on the back and the achievement of winning… I don’t think we’re being unreasonable, it’s your special day, you’re the only one who should be getting presents, surely?